Limited edition to 160 copies. Timing tracks isn't available on label copy. Multiple Personality Disorder is so fantastic. I can reccomend ! WOW! I love "MADHOUSE IN SPACE" I really feel that I want to go that place!! 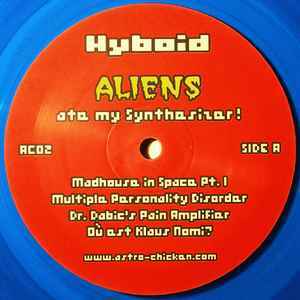 HYBOID is the musical project of Sebastian Hübert from the Astro Chicken label himself and was already featured with the track “Vogon Poetry” on Astro Chicken’s debut release “Chicken Accelerator” compilation (12”EP, AC01, 2010). Now HYBOID is attacking your sonic system with a debut mini-LP wonderfully entitled “Aliens ate my Synthesizer!”. Sebastian serves pure electronic space electro disco minimal pop from the outer space where lunatics are lurking in interstellar slots and aliens cross your path to eat your … synthesizer (oh well!) while they leave back nothing but neon green slime, yummy! The music is yummy, too, and would have fitted also to Bunker Records, Radio Cosmos, Falco Invernale or Das Drehmoment - it’s purely electronic, melodic, entertaining, and instrumental. The record starts with the beautiful and faaar too short “Madhouse in Space Pt. I”, with a smooth Korg KR-55 and a beautiful bass/melody à la The Silicon Scientist. Next is “Multiple Personality Disorder” in Bunker Records style electro, starting as a manic dark electro piece becoming a light and joyful electropop number in the end. Then “Dr. Dabic’s Pain Amplifier” which is pure Legowelt sound, ace track for the electro dancefloor! So, you’ll get an idea what to expect, if you are ready for a cool space trip, go for it!